Hello! Kasia here today with a layout made completely with this month's main kit. When I looked through the kits items I knew they will allow me to create almost a monochromatic layout- I love making these! I thought it would be also a fun excuse to talk a bit about adding texture to your pages- when you cut on the colors textures pop and allow you to highligth details of your work! Adding textures will make your pages look more dimensional. The easiest way to do it is through playing with layers. Try to use different materials- patterned paper, vellum, book pages, cardboard or stickers- they are all paper but have different quality so they will add lots of beautiful detail to your layout. Another way to add texture is using medias. Try to start with simple white gesso or acrylic paint- you can paint with them, smudge over the layers on your page, stamp the pattern you want- the thicker the paint the more texture will be visible on your finished project. 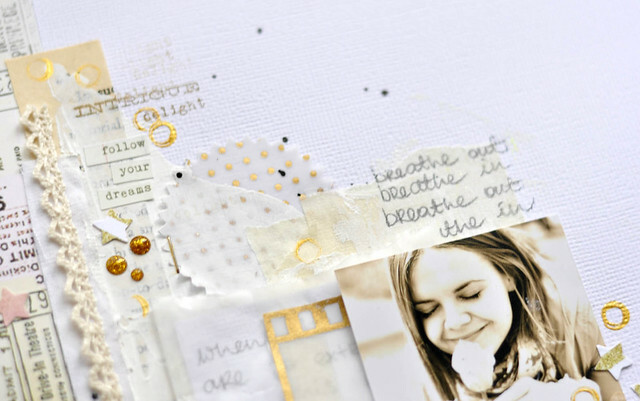 Don’t limit yourself with paper and medias- you can grab some other materials which will build texture look- think of small enamel dots, thickers, cut files or fabric- all or some of them layered on the page will make a beautiful, textured details for your layout! 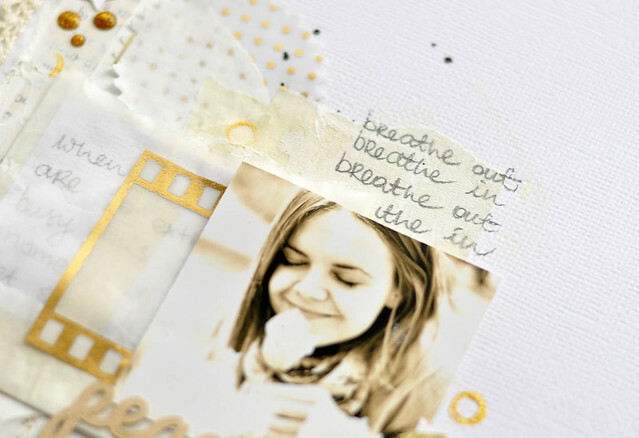 I hope you enjoyed these tips and will try with playing with textures on your projects! Have a fun day!